Our experience on our Swan 44 was that lighting was a significant power consumer as well as a source of heat. Those halogen bulbs get very hot! During the construction of New Morning our selection of a lighting supplier was one of the last decisions we made. Fortunately we found i2 Systems at the Ft. Lauderdale boat show, a company that was new to us. It was a great find. We’ve found the i2 lights to be excellent with good color balance, solid product line, outstanding customer service and run off the 24v house batteries with no need for power transformers. 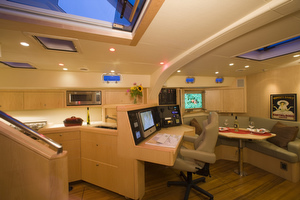 i2 lighting is used for all general illumination below decks. Here in the salon and galley you can see the Apeiron lights. These are mostly warm white, but also a few red lights that we use when underway at night. Most of the lights are dimmable, bright for when we need full light, dimmed down for when we’re watching a movie. At full bright they draw just 5w and throw out a lot of light which is further amplified by New Morning’s light interior. 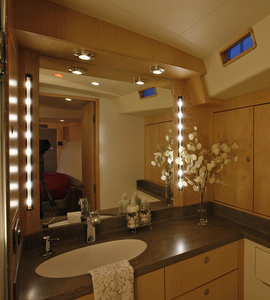 For under counter lighting in the galley, and the vanity lighting in the forward head, we used the i2 linear lighting. In the refer boxes and shower we used Frensch Resolux 551 lights which are entirely potted and more durable for those environments. 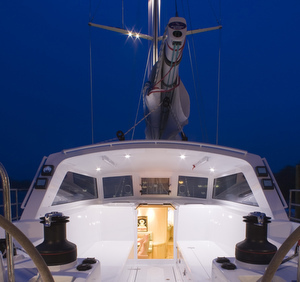 The engine room, mechanical space and bow locker are each lit with a Resolux 650 fluorescent. And finally we put a Frensch F-4 TouchLED at each bunk for a personal reading light. They draw less than 2w, are switched on/off just by touching them, can be bent around as needed for reading and then push back for sleeping. In the cockpit, under the dodger, we used the i2 Profile lights. 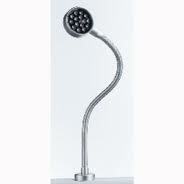 The Profile lights are also dimmable so we can adjust the lighting to match the need. The mast has two halogen lights on each lower spreader and another to light the foredeck.